Have you ever noticed the vibrant and astonishing greenness of a pine tree forest under a full moon? 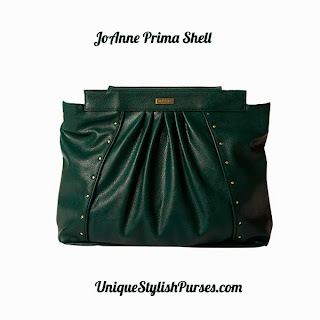 The Joanne for Prima bags is rustic, romantic, and her rich emerald textured faux leather is the perfect backdrop for the subtle glow of brushed antique brass rivets. This beautiful Shell features front pleat detailing and a back zippered pocket.